Cart racers have been part of many video game franchises from Super Mario to James Bond. Now the Angry Birds have their own with Angry Birds GO! Starting out you only get one bird and one track to race down. 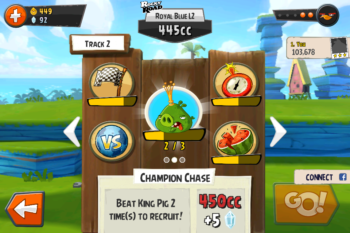 You need to win three “boss” races against a bird or pig to unlock them as a driver and unlock a new track. Each bird and pig you unlock has a unique power, such as the bomb bird who drops bombs and red bird who has a sort of nitro boost. Each track is different and has short cuts and obstacles to make them more varied and challenging. 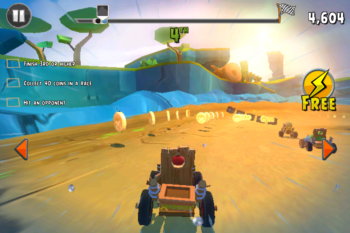 Other game types include a race against seven other pigs and birds, a race against a single opponent where you can set the difficultly, a race against the clock/bomb fuse and a race where you have to run over an amount of fruit to win. I enjoyed the races because upgraded carts felt really good, but I wish there were more tracks right at the start and that the wider tracks were marked better, because the path was not always obvious. Also, I did like that I could upgrade my cart’s top speed, acceleration, handling and strength, but it discouraged me from using more carts because of the coin investment I had to put in one to win. But what really bothered me is having to wait 30 minutes for my racers to recharge one energy and the price of some of the carts. Why would I pay $49.99 for a cart? That’s so expensive–I could buy a Mario Kart game for less. 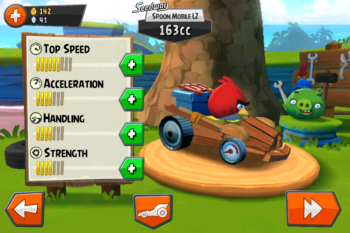 So if you’re in the mood for a good cart racer and don’t mind waiting hours or spending money to keep playing you can download Angry Birds GO! for free from the App Store. Then, tell us what your favourite cart racer is.